WASHINGTON — Companies with profits over $100 million would face new corporate taxes under a proposal released Thursday by Sen. Elizabeth Warren, D-Mass. 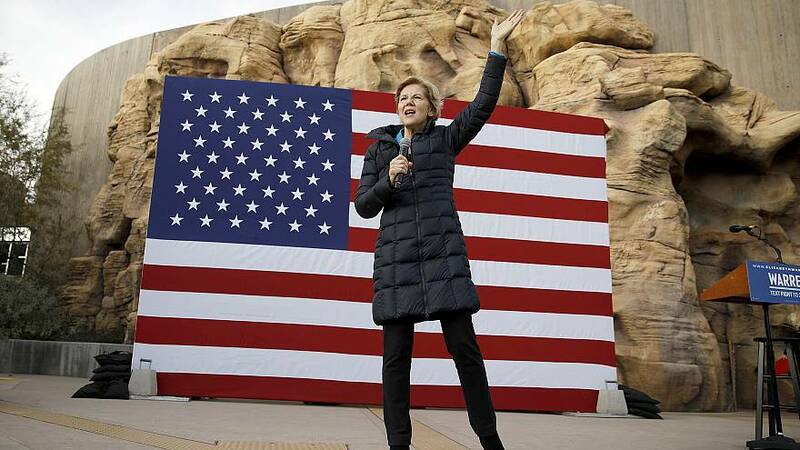 The 2020 presidential hopeful said her "real corporate profits tax" is aimed at companies that report large annual gains but pay little in taxes thanks to a variety of tax credits and deductions that are available to lower their overall bill. An analysis by the Institute for Taxation of Economic Policy, a left-leaning think tank, that was released on Thursday found that the number of publicly held corporations that pay no federal taxes more than doubled last year to 60, thanks in part to the $1.9 trillion tax cut President Donald Trump signed into law. "Because of relentless lobbying, our corporate income tax rules are filled with so many loopholes and exemptions and deductions that even companies that tell shareholders they have made more than a billion dollars in profits can end up paying no corporate income taxes," Warren said in a Medium post debuting her plan. The senator pointed to Amazon as an example. The company paid no federal taxes on $11.2 billion in income last year, according to ITEP. An Amazon spokesman said at the time that the company "pays all the taxes we are required to pay" in response to the study. Under Warren's plan, companies would have to pay a 7 percent tax on profits over $100 million that would stack on top of their other federal taxes. In Amazon's case, Warren estimated her tax would have raised its total bill to $698 million. An accompanying analysis by the economists Emmanuel Saez and Gabriel Zucman, who also consulted on Warren's plan for a wealth tax on the ultra-rich, estimated that 1,200 publicly traded companies would be affected and pay an additional $1 trillion in taxes over 10 years. They added that this was a "lower bound" estimate, since they expected the plan to raise more from some large private companies as well. Warren argued her approach was better than raising the corporate tax rate — which was cut to 21 percent from 35 percent under Trump — because it would prevent companies from using various breaks to reduce or zero out the new tax. "It's a small new tax — but because our richest, biggest corporations are so skilled at minimizing their taxes under our current system, that small new tax will generate big new revenue," she wrote.